Hindu God statues and sculptures add to the well being of one's house and is also a great source of decoration. They are usually priced as per the material and craftsmanship. Some of the most popular god statues include goddess Lakshmi statue, Ram Statues, Vishnu statues, Lord Ganesha, Lord Shiva, Lord Buddha, Goddess Durga etc. Out of these Lord Ganesha's statue is one the most popular and common sculpture which could be found in almost all Hindu Homes.Brass, a perfect union of copper and zinc, is used since 500 BC. 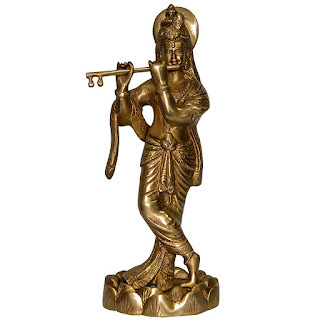 Our exquisite collection of brass statues captures the eternal, ethereal beauty of brass in timeless pieces of art. An art form that can enhance the ornate allure of interiors be it home, office or just about any place. No tastefully done interior is complete without a brass statue or sculpture. Connoisseurs place brass artwork in all together a different bracket, defined by no other art form. These religious statues are perfect imitation of our artisans skill. Indian artisans make various types of brass artifacts, acclaimed as much for their beauty and strength of form as their utility. Highly skilled artisans, put in their greatest devotion to render- fine quality, impeccable finish and a graceful persona to the sculptures.